On Monday, January 28th, I woke up to snow—6 inches of it! All through breakfast I begged Mommy and Papa to go outside and play. Schools were closed, and other kids were already outside. Miss Lynette was even skiing down our street! Finally, after I had put on lots and lots of clothes [right], we went outside. Papa and I tried to build a snowman, but the snow was too dry. 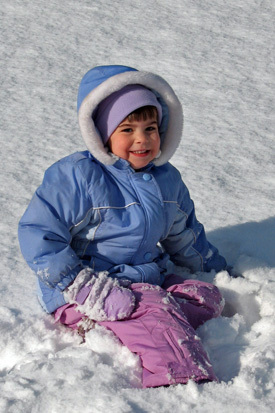 So we made some snow angels, and then we got out my little blue sled and Papa pulled me around the streets. While he pulled, I sang songs like Do a Dear. We went over to Joseph's house, and when he came out, Papa pulled both of us on our sleds. He was our personal dray horse! Mommy had to go back to our house to work, but Joseph and I stayed at his house to have soup and hot chocolate. I want it to snow every day! When Mommy woke me up on January 29th, I felt grumpy and said, “I don’t want to be four.” Then Mommy told me that a birthday gift was on the kitchen table. “I’m four today!” I yelled in excitement. Waiting for me was a book about birthdays. After a breakfast of my favorite cereal, Lucky Charms, I went to Montessori in the morning, then spent the early afternoon playing with Joseph. January 29th is his birthday, too! Once Mommy and Cameron got home at 3:00, I was allowed to open presents. I was very excited about the Disney princess oven that I had told Mommy I wanted in Target, and I wanted to start baking right away. I also liked the Illumino light art board, and Cameron and Papa helped me create some pictures while Mommy made dinner. When Mommy had asked what I wanted for my birthday dinner, all I could tell her was strawberries. So we had spaghetti, bread with butter (always a favorite), and strawberries. But I was so excited by presents and dessert that I could get down only a couple small bites of pasta, two pieces of bread, and a few strawberries. Then came the cake. There was a special mini-cake just for me made by Miss Trudy [left], and also a small chocolate cake that said "Happy Birthday Sofia." Mommy, Papa, and Cameron sang Happy Birthday and Lang Zal Zij Leven. 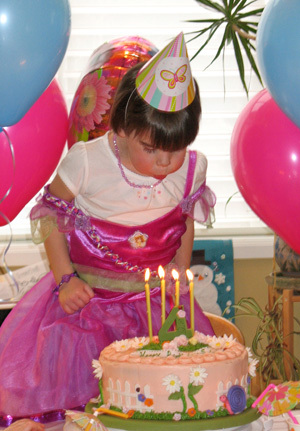 I still don't quite understand the “make a wish” thing, but I easily blew out the four candles. I ate lots of frosting but none of the cake. After dinner, Mommy helped me put together a new Curious George puzzle and play my new Finders Keepers game. 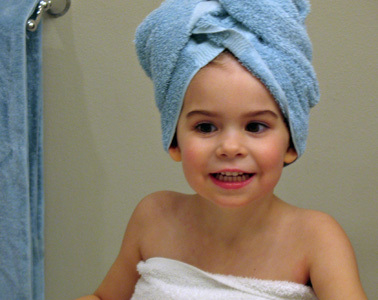 Then it was time for bed—and this four-year-old was ready! It seemed like my birthday wasn't just one day but a whole week of celebrations! On Thursday night, Mommy, Cameron, and I made chocolate chip cookies—with M&Ms instead of chocolate chips—for the birthday celebration at my Montessori. On Friday morning, Mommy and Papa both came to my celebration at Circle Time. First Miss Jody gave me a special birthday crown and placed a plate with a candle in the middle of the circle of children. It was meant to be the sun. Then she put cards with the names of the months around the sun and lit the candle. Mommy had written some sentences about each year of my life and brought a photo from each year. So Mommy read about my first year of life, and then I walked around the candle as the other children sang a song about the earth circling the sun (“1 year, 12 months, 365 days”). Then I walked around the perimeter of the circle and showed a photo of me from my first year to all my classmates. All my friends liked photos and protested loudly if they didn’t get to see them well enough. We repeated the whole process for years two through four. Then Miss Jody sang a a song about how I had traveled around the sun four times—think of that! Then it was time to hand out the cookies. I gave a napkin and then a cookie to each friend. It was a very important job! Everyone sang Happy Birthday and waited until I took the first bite before they ate their cookies. Last, Miss Jody asked each child to come give me a birthday wish before they lined up for recess. One by one, they whispered wishes into my ear—so quietly that even though Mommy was sitting right next to me, she never heard a word! All my friends waited in line until I had my shoes and jacket on so that I could be first in line and open the door. I held it open as everyone streamed outside for playtime. 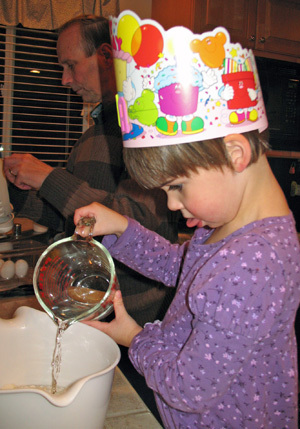 On Friday night, Papa and I had fun making cupcakes to share at the Oranjeschool [right, in my birthday crown]. Mommy topped them with chocolate frosting and sprinkles. At the Oranjeschool on Saturday, I handed out the cupcakes, and everyone sang Long Zal Zij Leven. My birthday Garden Party was on Sunday. 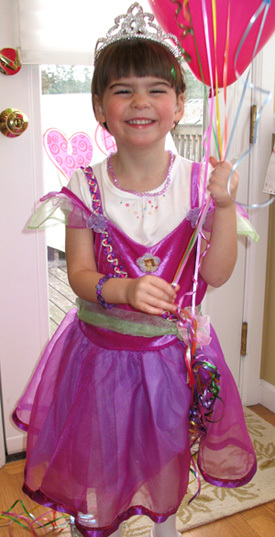 I wore my fairy princess costume and a sparkly tiara [left]. After lots of hustle, bustle, and decorating with crêpe paper, balloons, garlands, and flowers, guests began arriving promptly at 2:00. First came Sela, then Ava, Reiden, Merel, and Joseph. Except for Joseph, they all had fairy and princess costumes on, too. First we sat at the kitchen table to decorate flower pots with markers and sticky-back foam cutouts. Mommy had carefully painted our names on the pots. While we decorated we ate snacks of pretzel twigs, ants on a log (celery sticks with peanut butter and raisins), grapes, crackers, and cheese. Mommy poured lemonade from a watering can. As we finished, Miss Trudy painted butterflies on our cheeks. Mine was pink and purple. Next we played “Pin the Bee on the Flower.” Mommy had made a giant flower out of construction paper, and we had paper bees with tape on the back to stick on it. It was fun to spin around with the blindfold, but Mommy made the center of the flower so big that it wasn't any challenge to stick the bee there. So after we'd each stuck on just one bee, we started the next activity—cake and ice cream! Miss Trudy had made a round, two-layer, chocolate and vanilla, pink-frosted cake spectacularly decorated with white picket fences, snails and ladybugs, daisies, and roses made of sugar. Mommy carefully walked it to the table while everyone sang Happy Birthday and Lang Zal Zi Leven. I needed a few tries to blow out the four candles [right], but eventually I did it. Mommy was nervous to cut the cake because it was so beautiful; Miss Trudy got it started and then Mommy passed around the pieces. We also had scoops of berry sherbet in cupcake papers with M&M flowers on top. I liked both the ice cream and the cake. Finally it was time to open gifts. While Joseph played by himself on the floor, the girls all gathered round and watched while I opened each one. The cards weren't too interesting (I guess you need them to know who the gift is from), but I liked all the presents. Sela gave me a My Little Pony Pinkie-Pie pony and CD/book, and Reiden gave me the book Duck Soup, which we read that night before bed. Ava gave me a purple backpack with my name on it, and Merel gave me a Nijntje DVD and a Dutch sticker book. From Joseph I got a Hanna Montana wireless microphone. After I opened each one I gave hugs and thank you’s. With 15 minutes until 4:00, the girls ran around the house together until parents started arriving. Everyone was sad to leave because it had been a really fun party. 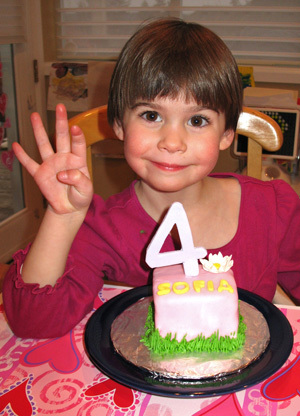 It's exciting to be four: there's so much I can do now! I like many more kinds of foods, and it's fun to use my own special knife and fork to practice cutting them. I can even get my own bowl and cereal out of the cupboards and pour it for myself! I love to help: Mommy lets me help set the table, and I can use a small vacuum to clean up under my chair (I make a big mess). I get Papa his slippers and help Mommy put the laundry in the washer. I like to use words. I like to tell big stories about imaginary people, animals, and places—using lots of imaginary words. One of my favorite words is "pooh-pooh head." In fact, I know so many words now that I don't need to have as many tantrums or whine as often. Sometimes I tell Mommy, "I'm feeling frustrated" or "I feel disappointed." Then Mommy gives me big hugs. In Montessori, I can choose my own work now, put things back when I'm done with them, and clean up after myself. I'm better at sharing and waiting for my turn, and I'm making more friends. Some of my best friends are Sela, Reiden, Lexi, Luna, Josh, and Jason. I can also read lots of three-letter words, and I can spell my name and even print it (with just a little help from Mommy). Sometimes I still want to be smaller. Sometimes I even want to be a baby again. But mostly I'm glad to be getting bigger, and I'm glad to be four. At my four-year check-up I was very worried that the doctor would give me "pokies" (vaccinations) because it had hurt to get a flu shot just a month before. When Dr. Johnson assured me that he wouldn't give me a shot, we had a great time together. The nurse asked me lots of questions about my day. I liked her and gave her a big hug. I weighed 35 lbs (50th percentile) and measured 40 inches high (70th percentile). She tested my eyes with a chart of symbols, and my vision was 20/20. The doctor listened to my ears, looked in my mouth, and put a stethoscope on my chest. Then came the bad news that although the doctor wasn't going to give me a pokie, a special nurse was going to come in and give me chicken pox and MMR vaccinations. I was very unhappy, but the promise of a vanilla cone from McDonald's afterward helped me get through it. It was a big cone, too!